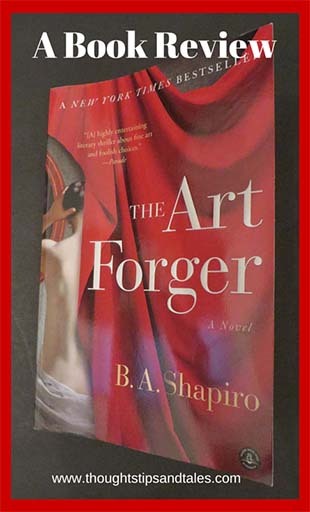 If you enjoy mysteries and human interest stories written in a conversational style, you’ll like The Art Forger: A Novel by B. A. Shapiro — even if you (like me!) don’t know anything about art. Claire is a talented, struggling Boston artist who paints reproductions of famous paintings to eke out a living until she makes it big with her “real” art. A charming gallery owner convinces her to reproduce a famous painting with a checkered past in exchange for her first art show in his upscale gallery. The description of how artists work, and the methods they use to create paintings — and forgeries — is fascinating. In addition to the primary story line, the secondary plot involves Claire’s former boyfriend, Isaac (also a painter). To help him climb out of an artistic slump, she painted a masterpiece — and he claimed it as his own. The tale of his betrayal and her subsequent ostracism by the art world after she tried to prove she was the artist, interwoven with the story about her deliberate creation of a forgery, ironically shows the same subject from two points of view. I highly recommend this book. It’s fast moving, it’s entertaining and I couldn’t put it down. This entry was posted in art forger, book review, books and tagged art forger, book review. Bookmark the permalink.